Save for the LN or the Veritas. Waiting a month or two is NOTHING against having a tool you will enjoy for the extent of your hobby. If you get a fair Stanley, or an ok WoodRiver, you can probably do what’s needed to make it sing, but there is no work to the premium plane and they will work exceptionally for your lifetime. Now, if you were asking about a smoother, or a jointer plane, I would suggest finding an old Bailey, Record, or Miller Falls and tune it up and use it. You learn a lot about the plane and know what it takes to get it to sing. The vintage LAJ market is really high due to a lack of supply. I wouldn’t pay $175 or so for a vintage Stanley #62 knowing I could get a LN for less than $100.00 more. Buy the LN or Veritas. Be Happy. +1 Used Stanley bevel up LA market prices are absurd compared to Stanley bevel down planes. Spending more than $150-$175 for antique Stanley LA jack is waste of money when you can buy a new Wood River for only a few dollars more (that is unless you collect antiques). I own antique Stanley, new Stanley Sweetheart & Wood River LA Jack. New Stanley Sweetheart is junk compared to antique versions. The newer castings are sloppy and a general PIA to get tuned, doesn’t stay tuned between uses, and blade dulls quickly. Can not recommend new Stanley Sweetheart LA Jack to anyone serious about hand tools. If you want to save a few dollars for 1st LA Jack plane, the Wood River LA Jack is nice tool for money. It required a little tuning and full blade sharpening when new, but it performs just as well as my Veritas LA smoother. 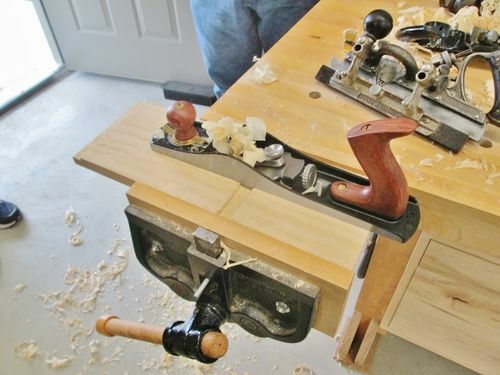 IMHO – you do not need LA plane to build a typical hand tool bench. #4 smoother with either A2 or PM-11 blade to clean up any marks left behind by large planes. PS – Bevel up .vs. Bevel down planes each have negatives that impact how I use them. My Veritas LA smoother usually has either 38/50 degree blade in it, or toothed blade for scrub work; both for figured wood. My Wood River LA Jack is principally used on a shooting board with 35 degree bevel for end trim work. I also use smaller bevel up planes for trimming rabbits or tenon cheeks. Bevel up planes are used for most everything else. My view where LA planes are best (end grain & figured wood) may be skewed, but I there is another wood worker that posts similar thoughts [ https://paulsellers.com/2014/04/questions-answered-why-bevel-up-bevel-down-low-angle-high-angled-planes-are-equal-to-task/ ]. As a a self-proclaimed novice woodworker, a specialty tool like the LA jack is one of the last planes you should be looking to buy. Start with a standard #5 jack (I too advocate an inexpensive, easily-found, vintage Stanley). You could add a smoother (#4), and even a jointer (#7 or 8). In short, you could assemble a trio of versatile planes, and still be short of what you’d spend on a new LA jack. In addition, the knowledge, familiarity and skill you’d acquire disassembling, cleaning, and tuning vintage models is invaluable. I have a bevel up Veritas #4 and a LN bevel down #4. I reach for the Veritas. For a low angle jack I suggest a premium plane, specifically the Veritas (why over the LN, I will explain in a moment). The cost of a good old Stanley #62 is just to high in comparison. The reason I prefer The Veritas to the LN for a low angle jack is two-fold, 1 the availability of PM-V11 steel which I have come to really prefer and the fact the Veritas BU jack shares blades with the Veritas BU smoother. Sharing blades cuts the cost of having extra blades for different bevel angles and expands both planes capabilities for less money. In short, you could assemble a trio of versatile planes, and still be short of what you d spend on a new LA jack. In addition, the knowledge, familiarity and skill you d acquire disassembling, cleaning, and tuning vintage models is invaluable. Makes a lot of sense and well worth considering, but if you insist on a new LA plane, I also would go for the Veritas. OR..use this one right now.. I agree with Johnny 7. First order of business I suggest replace that bench plane ASAP. You can search for a vintage Stanley (or pay too much on Ebay) but to get up and running, IMO you can’t go wrong with the WoodRiver models. (Be prepared to spend some time flattening the back). I “saved up” for a LN LA Jack and yes, its worth saving up for. I definitely would not recommend any modern Stanley plane. That said, its turned out to be of limited use for me in my shop. I originally bought it intending as a shooting plane (got the hotdog attachment). But in my hands, the plane is too small, too light, and too short. So I’m back to using a #6 as my shooter. The only time I specifically reach for the LA is planing end grain, and truthfully that’s really finding a reason to use it. I guess one big advantage in a bevel up would be having multiple irons honed at high bevels for unfriendly grain. Interesting, now I am second guessing this. I read and watched quite a few vids about how the LA 62 with multiple irons can replace a few planes for many. The Paul Sellers article was interesting, then again he is so skilled he could probably use a rock with better results than me with a nice plane. I would like to minimize how many tools I need if possible. I guess maybe I should get a #5 first. Of course where I live the usual scoundrels who ruin most hobbies are snatching up any vintage tools on Craigslist the second they post and then marking them up for a profit like its their job. So they tend to go for about $125 for a #5. I am hesitant to buy one on Ebay as they are hard to tell the true condition without seeing it in person. But it seems I can find them for around $40 plus $15-20 shipping, and then hope its in decent condition and not one a flipper is trying to unload because its beyond repair. Maybe I”ll just bite the bullet and find one close by that I can inspect in person. Another option is to let other LJ members know you are in the market for the planes. There are quite a few on here that buy and sell. The nice part is that you will know what you are getting. Ebay can have some great deals, if you know what you are looking for and at. Even then, it’s still possible to get burned. Same with local shops and flea markets. I’ve done both (great deals and burned). If you do enough transactions, it’s not difficult to come out ahead, but more of a risk with buying just one plane, especially without experience. First place I would recommend to check is with Don W at Time Tested Tools Don is a long time LJ member and will treat you right. Even if what you want isn’t listed, shoot him a message, as he is always picking up more planes in his travels. OK, I’ll put in my $.02. From 30+ years of using, collecting, and restoring old tools, my user planes include a full set of Stanley’s including a LA 62. It gets very little use. You mentioned building a bench. My own bench top of Beech and Maple was flattened with a Bailey No. 7 and 8… The specific plane I use depends on what the work requires. If working end grain, the LA 62 is great, if jointing or flattening, a long 7 or 8, if finishing, a 3, 4, or 4 1/2… If I had to choose just one bench plane for all work, it would be an early Stanley 5 1/2. It can be adjusted to most any task. It’s heavy enough for flattening, long enough for most panel jointing, and can be set up as a heavy smoother… LN planes are top notch, I have a couple for “special” jobs ;-). Quite expensive relative to the work I do… And then, using tools older than I am just feels right. Most of my planes are from estate sales, junk shops, yard sales, etc. I rarely use C. List or fleabay. Just be patient! Ok so I think i am holding off on the LA jack plane for now. I scoured all the antique shops around last week and picked up an old Stanley 5 1/4 for cheap and then on CL found parts of a really old Stanley #3 that I was able to complete using parts if the 5 1/4. I read a few places to look for Pre WW2 Stanley planes but ome place had a WW2 Stanley #7 with the Bakelite knob for a decent price. Is that ok to get? Otherwise the older #7s seem to go for double. In collecting, repairing and using Stanley planes, I am one of those that prefer pre WW II Bailey’s or Bedrock planes. The Planes made during the war show cost cutting in fit & finish and due to war shortages, substitute materials, i.e the Bakelite adjuster. After the war, Stanley was apparently in cost cutting mode. None of the post war changes were improvements in use, just cheaper to manufacture. The best of Stanley’s quality with all the best features in my opinion are those made between 1910 and 1928. Try to look for planes with “PAT’D followed by dates of 02 and 10 on the bed behind the frog. If the bed of the plane has ” Made in USA” anywhere it is later than 1928. Be patient, a good plane will show up when you least expect it. Tell everyone you know that you’re looking for old tools… The old plane from a great uncle is in someone’s closet… I’ve had some real treasures literally given to me because I was interested! I own the Stanley LA62 and agree with comments above. It isn’t a favorite, dulls quickly compared to veritas planes and has a TON of backlash due to sloppy machining at the adjustment receiver.